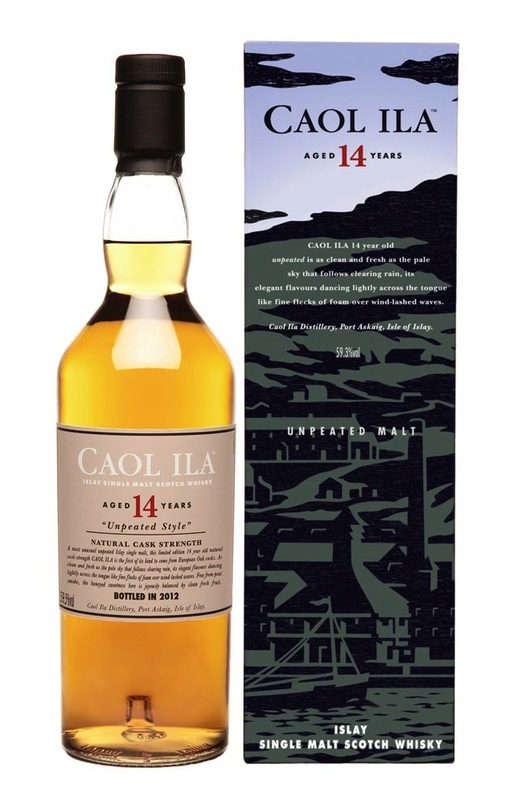 Caol Ila 14yo Unpeated (59.3%): This unusual expression of Caol Ila is one of Diageo's special releases released in October 2012. It is the oldest unpeated Caol Ila released so far, aged in ex-sherry European Oak casks and bottled at cask strength. Only 5958 bottles have been made available worldwide. Thanks to Joe Howell from Federal Wine and Spirits for securing a bottle for me. Color: Gold. Light amber with quite visible legs. Nose: Fruit salad with gala apple, bosc pear, honeydew and cantaloupe slices. Late Sunday breakfast with a bowl of muesli tropical topped with milk and honey. A few drops of water elevates the honey aromas and add middle-eastern spices: a great deal of cinnamon and nutmeg with tobacco leaves, newly purchased buckskin jacket and old decomposing upholstery leather aromas. I also get hint of smoke... Are we sure that this dram is completely unpeated? Palate: It's surprisingly easy going without adding water in spite of its high abv but pretty much muted with only sizzling black pepper, coarse salt and cheap orange candy notes. With water the palate opens up. It is unexpectedly salty: good news! I was afraid that it will be a sherry bomb. Fruit bowl we had from the nose is now topped with zesty citrusy slices and table salt. It reminded me my father sprinkling salt on his grapefruit slices. Some peach compote, crunchy malt notes and that suspicious smoke again. Am I making up this smoke thing? Finish: Medium long with brine and white pepper. Overall: Hmmm, this is a tough one. I easily can say that I liked it and to be honest I will enjoy it as long as the bottle last. No doubt about it... But turning a very good spirit into a main stream sherried whisky shouldn't be enough to make it "special". I am not talking about the regular peated expressions. I am a huge (I mean huge!) fan of the earlier ex-bourbon cask matured unpeated Caol Ila releases and I missed those beautiful grassy and malty notes. Somehow ex-bourbon casks suit much better to the Caol Ila spirit. It lifts the core and amplifies it in a beautiful way. On the other hand this European cask experiment could end up easily at a darker side. I am glad that nobody tried to push the idea further and drowned the whisky in sherry butts. At the end if you leave your expectations at a side it is a nice, smooth and enjoyable dram with a slightly high price tag and a good alternative for Highland Park 12.